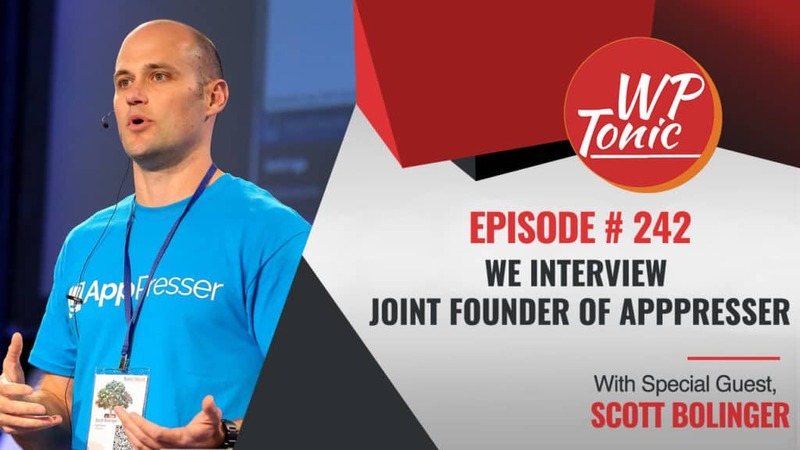 This week on the WP-Tonic Podcast, host Jonathan Denwood interviewed Scott Bollinger of AppPresser. The two talked about Scott’s business, and the WordPress ecosystem. Scott got the idea for AppPresser (https://apppresser.com/) when he went to WordCamp San Francisco and heard Matt Mullenweg talk about WordPress moving into the Aapp market. He thought of WordPress sites as mobile apps and set out to create a product that would allow you to create a mobile app from your WordPress website. Our episode this week is sponsored by INTELLIGENCEWP.Finally, an analytics plugin that provides valuable metrics and results that increase your leads.INTELLIGENCEWP. There were many technical hurdles to cover and he partnered with the team at Web Dev Studios (https://webdevstudios.com/)to build the actual product. One of the big concerns was that they would build the app, and that Apple might reject it from the App Store. When it was accepted, they knew they had something to package and use. Scott felt that they were fortunate with this product because the idea was different and quickly gathered interest. He said, “We didn’t have to do a a lot of marketing. When we launched, we had an audience.” He attributes this to articles written and buzz created because it was something different and something people saw as valuable. From other product launches he as done, he finds that much buzz to be abnormal. In the initial launch, they did not have trouble converting people to paid users. Again this is unusual. Frequently product sales are slow to build. From the beginning they made a lot of sales. They are moving to a SaaS product. They still have plugins but now have a cloud-based app builder which is much smoother than what they had. They can host push notifications, and provide a better user experience for their customers building apps. Aside from discussing AppPresser, Jonathan and Scott talked about the WordPress ecosystem and a post Scott wrote after attending an eCommerce conference where WordPress wasn’t mentioned. Scott explained that the conference was a marketing conference and that all of the eCommerce discussions covered selling on Amazon and Shopify. Although WooCommerce is the largest eCommerce platform on the Internet with more stores than Shopify, it may not appeal to a non-technical market. He wrote Perspective on WordPress (http://scottbolinger.com/perspective-on-wordpress/) on his ScottBolinger.com blog to show that while we know that WordPress runs over 20% of the Internet, those of us in the WordPress community think that everyone knows and cares about WordPress. Actually, this isn’t the case. He feels WordPress is best for agencies and developers building for clients. If you’re not technical, it can be incredibly difficult. Companies like Squarespace and Shopify are often popular with non-technical audiences because they are easier to use out-of-the-box. Of course, he points out that the benefits of WordPress are the large ecosystem of plugins, the fact that it is Open Source, and can be customized to almost any requirement. It’s just that the general audience may not see that or understand its value. Jonathan: Welcome back folks. This is our Wednesday interview show. It’s episode 242. I think that’s quite an achievement in its own right really. And we’ve got a fantastic guest on the show. I’ve been wanting him to come on the show for quite a while actually and he agreed. He’s a really busy man. And it’s Scott Bolinger. Would you like to introduce yourself, Scott? Scott: Yeah. I’m excited to meet the guest, the exciting guest that you have today too because I’m not that exciting. But thanks for having me. Yeah. So I think today we’re going to be talking about the WordPress product market. My name’s Scott. I worked on AppPresser and Holler Box and I write articles sometimes. Jonathan: Yeah. I think you’re like most very excellent entrepreneurs and just really interesting people you underestimate yourself a little bit Scott. I think Scott’s been one of the more, to say he’s been one of the more interesting WordPress Developers and entrepreneurs is a slight understatement. But let’s get right into it. Like I was saying before we went live Scott and which I really meant, AppPresser I thought was just an amazing product. It’s, I’m trying to struggle for the right word here, its scope, its ambition, I think really drove WordPress to another level in just its ambition. What led you to, because you’re the joint founder, what led you and your other joint founders to develop the product and go for it basically? Scott: Yeah. So at the time I was looking for a new project to start and went to WordCamp US and heard, and actually at the time it was WordCamp San Francisco and heard Matt Mullenweg talking about WordPress moving to be more of an app platform. I don’t think he was talking specifically about mobile apps but that’s kind of in my mind where I thought of was mobile apps. On the plane ride home, I had thought of a bunch of different ideas for different things I could do and I was just kind of like, “This one’s okay. This one’s okay”. But then I thought like, “Mobile apps for WordPress. That’s a cool idea”. And so I was like, “Okay. That’s what I’m going to do”. So ended up just going home and started tinkering with some stuff and getting a really really rough sort of concept together. And then approached some partners and joined up with Brad, Brian, and Lisa from WebDevStudios and we got to work on it. Jonathan: A great team. Got a great reputation in the WordPress ecosystem. So how much was their help really necessary to get this moving into an actual commercial product? Scott: It was great. We worked together and built the initial product which was an interesting journey because we had no idea how it would work because we wanted to have a plugin that, for example, shows a button for the native device camera. So when you click a button on a WordPress page, it’ll open up the native device camera. And then eventually we got to the point where we could actually upload the image to the WordPress media gallery. And having no prior mobile app development experience we had no idea how that would work. And actually, the way that we built the initial product was very different from how most people were building mobile apps at the time. So it was interesting, excuse me, and each feature was like that. It was like, “Okay. Now we have to figure out geolocation. Now we have to figure out push notifications”. That was a big one. “We have no idea how this works. All right. Let’s figure it out. So how do we send a push notification from a plugin?”. And when it worked we were just like, “Oh, crap. It works”. And so multiple points along the way I was like, “I don’t know if this going to happen because if we can’t make these features work, then we don’t have a product”. And then when we finally had something with a bunch of features that we could submit to the App store, it was like, “Well, if Apple rejects our app for some reason because they don’t like that we’re doing it with WordPress or something, then we don’t have a product”. And so when Apple accepted our app, our very first app in the App store, we were just ecstatic because we’re like, “Okay. Now we have a product and let’s package it up and sell it”. And that’s what we did. Jonathan: And this was before the restless API really or . . .
Scott: The restless API. I like that. I like that name. Yeah. Scott: Yeah. I like that better than REST API actually. Yeah. Before the REST API. When version 1 of the REST API came out, we were one of the first people to start jumping on and working on it and we’ve been using it in apps and stuff. So that was exciting. And now, of course, the version 2 of the API is integrated into our newest version of our product which we love. So, but, yeah. A lot of things were different 4 years ago. Jonathan: To say the least. So basically, you had the technical challenges and then you’ve got all the business side as well. Scott: Yeah. The interesting part about the business side was I feel like because our idea was, it was different than what other people were doing we got a lot of interest in it. Scott: So we didn’t have to do a whole lot of marketing or anything like that because so many people were interested in it that when we launched we already had an audience and people signed up our email list to be notified when we launched. And then when we launched, a lot of people wrote articles about us and linked to us and things like that. There was just a lot of buzz. So I think that that’s not normal. I’ve launched other products and it’s very abnormal to have something that people are so excited about that they come to see it without you really doing anything except telling people about it. So that was kind of a cool experience to see what it’s like to have an idea that people get really excited about without you having to shove it down their throats with marketing. Jonathan: Oh. Just two comments there. First of all, obviously, I totally see that. That’s fantastic, isn’t it? But then converting those to actual paid clients, paid users of the product might be a different story. So I want to ask you that. But secondly, did you get a few people that you trusted that just went up to you Scott and say, “Well, this is great stuff Scott, but you’re bonkers. This is so ambitious. Scott, you’ve lost the plot a little bit”. Scott: Yeah. Not really. I mean at the time, one thing is we kind of thought we were the first people doing this type of thing. But really, people have been making mobile apps and integrate with WordPress for a long time. We did it in a very different way that I think was unique. But, yeah, there were people that kind of said, “Hey Scott. You’re not the first person to do this. We’ve been doing this for a while, but just for clients”, or whatever. Not in the way we were doing it but like apps for churches that integrate with WordPress or whatever. But nobody was really telling me like, “No. It’s a bad idea. You’re crazy”. It was more just people were excited to it like, “When can I see it?”. And as you mentioned, I mean, converting people into paying users, we didn’t have any problem with that either. We had a very very successful first month which I also think is very abnormal. Because in other products I’ve launched and talking to my friends who’ve launched products that have since become very successfully, it’s usually a pretty slow build. Like 2 years in you kind of hit a point where you’re starting to grow quickly. But for us, right from the beginning, we made a lot of sales. And so that was pretty fun. Jonathan: Do you mind me asking, if you don’t want to divulge it I totally understand. How many active users have you got at the present moment? Scott: I don’t have an exact number but it’s over 1,000 for sure. Jonathan: Fantastic. So you’ve written some, you went to an eCommerce convention and you said you were slightly, going to word this correctly, you were slightly surprised that WordPress wasn’t part, I think the wording you used is that WordPress wasn’t mentioned by any of the other delegates once in the couple of days plus you were there and it was a bit of a wake up for you. And then, you’ve written another article talking about the ecosystem in general when it comes to commercial themes and plugins. Would you like to broaden that out a little bit? Got any additional thoughts about those couple of articles that you’ve written recently? Scott: Yeah. Those are two different subjects I think. So the first one is a post I wrote called Perspective on WordPress on my blog on scottbolinger.com. If you’re not familiar with it, I went to a marketing conference that was mostly focused around marketing and everybody there was using Shopify basically and selling on Amazon and Shopify. Nobody even said the word WordPress or WooCommerce. And WooCommerce is the largest eCommerce platform on the Web. It’s way bigger than Shopify in terms of number of stores. So I just thought that was really strange. And a lot of people commented on it and I don’t know. I just thought it was interesting for me to get an outside perspective that even though we in the WordPress world think that WordPress is like 27 percent of the Internet or whatever, everybody knows about it or everybody should know about it and care about it. That’s really just not the case. Jonathan: No. Not at all. Have you any additional thoughts? The weeks just fly past, don’t they Scott? So have you reflected back about some of the things you said in that article and why you think WordPress wasn’t mentioned at all at the conference? Scott: Yeah. I think it’s because if you are a non-technical person WordPress is just not the best way to get started. WordPress is more for Developers and Agencies building sites for clients. It’s not always the case. I definitely had some exchanges with Matt Mullenweg about this and he obviously disagrees. But if you are someone who’s non-technical and you need to go set up a WordPress site, especially a self-hosted one, it’s incredibly difficult. And even if we look at Shopify versus WordPress.com, I think that there’s still a lot of difficulty even just using the WordPress platform on WordPress.com. My wife and I did a travel vlog a while ago, a few years ago when we did some traveling. She had trouble even just creating a post and making it look the way that she wanted it to look and she didn’t like it. She didn’t want to use WordPress for it. She’s a teacher. And now she uses Google Sites or something like that just because it’s so incredibly easy. I think a lot of people kind of feel the same way. If you’re setting up something for a client and then you can teach them what they need to do and you set that up for them, I think that’s where WordPress really shines. But if you’re someone who is non-technical and you just want to sell something online, then Shopify is a much better way to start. It’s not as flexible. There’s definitely pros and cons to each approach. Maybe you’ll outgrow the Shopify store. You can’t customize it as much as you want. Things like that. But for someone to just get started and start selling something without any technical experience, a platform like Shopify is leads beyond where WooCommerce is right now. I know WooCommerce is moving in the direction of being easier. I just came back from WooConf and they’re definitely working hard on the user experience and the onboarding process and things like that. And I think that it’s getting better and it will continue to get better. But the difficult part about WordPress is there’s these siloed areas of improvement where you can make the post editor better with Gutenberg and you can make the WooCommerce onboarding experience better just through their plugin. But that doesn’t make WordPress easy to use because you still have to go to a different place to edit your Widgets. If you’re a non-technical user and you look at your website and you’re like, “I see a sidebar. I just want to put an Ad in that sidebar. How do I do it?”. Well, now you have to tell them, “Okay. You have to log into your site and you have to go, not to the pages that you’re trying to edit that has the sidebar, but you have to go to the Widget area. And then you have to look in not the secondary Widget area, the primary Widget area. And then you have to open a Widge and then you have to figure out how to edit that Widget”. That’s ridiculously complicated to just put an Ad in a sidebar on a page. So it’s this problem that we have with just the way WordPress is made. And I’m not saying that it’s bad that WordPress is that way or that anybody did anything wrong in the way that they built it. I’m just saying this is where we’re at with the platform and it is not easier for non-technical people to use and it’s not going to get there anytime soon with just siloed areas of improvement. Again, I don’t want to say that people working to make WordPress easier like the core team and Gutenberg and all that kind of stuff, I’m not saying that they’re doing a bad job or anything like that. I think they’re doing a great job and we’re moving towards something that’s getting better iteratively which is great. But it just is not going to be anywhere near Shopify type of experience or Squarespace type of an experience anytime soon. But I will also say a that is that there are lots of things that WordPress has that Squarespace and Shopify don’t have like the plugin ecosystem and the amount of customizations you can make and things like that. And the fact that it’s open source and you’re stuck on their platform. Those are all great things. Jonathan: As you were saying it, these are all things I’ve been saying on our Round Table show Scott, but nobody listens to me. Hopefully, they’ll listen to you. I totally agree. You’re analyzation of the situation, I think it’s totally spot on. We’re going to go for our break folks and we’re going to come back and we’ll delve some more in this great conversation with Scott. And we’ll be back in a few moments folks. Jonathan: We’re coming back folks. I’ve really enjoyed the conversation with Scott so far. He’s been saying some things that I totally agree, I haven’t disagreed with anything Scott’s said so far. Like you say, I think your analyzation of the present situation with the interface and the frustration that new users can have with WordPress is totally spot on. And I agree. It’s not going to be fixed overnight. But I think the good news is that none of these problems that you mentioned can’t be fixed though. I think they’re all improvements that we will see. And it’s a fast-moving area, isn’t it Scott? Scott: Yeah. A lot of these problems can be solved with just better onboarding and maybe like frontend editing. If you can edit all that stuff on the frontend, you don’t have to go over to the Widget area just to tweak something in the sidebar. It’s all solvable. This difficult with WordPress is it all has to be backwards compatible and there’s so many sites using it and it’s really difficult to make big sweeping changes. And that’s why platforms like Shopify and Squarespace where they can start somewhere, well, first of all, it’s hosted platform. So it’s kind of comparing apples and oranges. But they don’t need to worry about all these problems that we have to worry about. Like I mentioned in my article, even though I’m comparing WordPress to hosted platforms, it is apples and oranges. But at the same time, the end consumer doesn’t care. They don’t care that they’re going to be stuck on a proprietary platform. They don’t think about that. If they do think about that, they wouldn’t even be going to those platforms. They’ll hire a Developer to pay for WordPress or they’ll tinker around with it themselves. But the thing is if you just want to, like the people at this conference that I was talking about, if you’re just like, “I want to start making money selling bacon on a subscription”. I met a guy who sells bacon. He goes and sources this really good bacon locally and he sells it like subscription based product where he sends people packages of bacon every month. And he’s not a Web Developer and he doesn’t want to mess around with the tech. He just wants to sell his bacon. Jonathan: I just want to sell the bacon. Scott: Yeah. He wants to make bacon. He wants to sell it. He wants to bring it home. All that stuff. So if he just wants to be like, “I just want to sell my bacon”. If he were to ask me, “Hey Scott. What should I do for my website?”. I’m not going to tell him, “Go buy a domain. Go to a hosting platform and set up a host. Go install 20 different plugins. Go configure your taxes and your shipping and all that kind of stuff in WooCommerce. Get a theme”, all this kind of stuff. That’s ridiculous. So I would just tell him, “No. Just go pay Shopify and start selling literally tomorrow”. So it’s really hard to compete with that. Jonathan: Well. It would be. You need to prove the concept that there’s a market and there’s some interest in your bacon to start off with. Jonathan: There’s a lot of business issues that you’ve got to deal with in the initial startup situation. So the last thing you need is to get yourself in the trenches with WooCommerce really. But at the right moment, it’s the right choice at the right moment, isn’t it Scott? So onto your second article which I agreed with. It’s a consequence of a maturing market, isn’t it? I think that was the key thing that you were pointing out. What was appropriate 4 or 5 years ago isn’t particularly going to work for you in the now basically. I just wanted to put this to you. I think there’s also some other problems about the relationship between free and premier, between how people have been using the theme depository and the plugin depository and around security issues. I feel that there should be a subdirectory where if you want to offer a free plugin, you’ll be in the free directory. If it’s a paid one, you’ll be put in a separate area and you have to meet some coding standard. And obviously, we have that at the present moment but they’re all volunteers and they do the best they can. But if a plugin or a theme producer had to pay to have the theme checked over and meet certain standards, then they would get a sticker which will say, “Approved by WordPress”, or whatever wording you want. Am I rambling Scott? Or can you see any logic where I’m going with this? Scott: So are you saying you would have, you want to add a premium plugin and theme directory to WordPress.org? Scott: Yeah. I would love that personally. I think Matt is really resistant to that. Jonathan: Why? Why Scott? Why? Scott: You would have to ask him. I don’t know exactly. He’s real big into just open source free stuff. He sells stuff himself. Scott: I don’t know exactly why. You have to ask him. But I think it’s a great idea personally. Jonathan: Yeah. Free is fine to a certain degree. But people got to make a living, haven’t they? They’ve got to make money so they can invest in other products and for the whole ecosystem to be successful, doesn’t it Scott? So there’s nothing wrong in making a living and a profit, is there? Scott: Yeah. You can do upsells in your theme and plugin. So it’s not like its completely, they’re not completely against making money which I think is good. 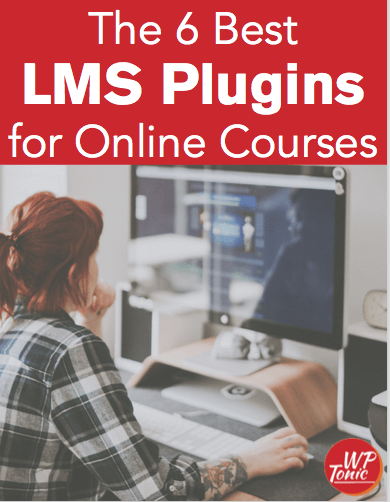 A lot of people make a lot of money with upsells or with just a free core plugin like WooCommerce, for example. They’re making tons of money and their core plugin is free. Or there’s people who make 30 grand a month from their upsell theme having a light version in the directory and then upselling people to the premium one. But, yeah. I think just a straight premium only directory would be really nice for people because it could be vetted. Marketplaces like CodeCanyon and ThemeForest that do this now are obviously very popular. But the stuff that they’re selling there is questionable as to whether that’s actually good for WordPress. If you ask any Plugin or Theme Developer, mostly Plugin Developer about their support issues many of their support issues come from the products that are purchased on marketplaces. Scott: If WordPress.org had a directory that they held to a higher standard, then that could be really good for the WordPress ecosystem. Jonathan: Yeah. That’s the whole reason why I consistently bring it up because I see it as a win-win for everybody. But like you say and you dealt with it very tactifully Scott. I will have to get Matt on, won’t I and inquisitate him on why he has, I’m sure he has very logical reasons why he’s not too keen on it. But it’d be a great discussion. So basically, how do you see your own AppPress moving on? Have you got any upcoming updates? Or have you got ambitions where you’re going to be taking the platform and the plugin? Scott: Right now, we’re just kind of focusing on AppPresser 3 which is what we released earlier this year. The new platform is not even a year old yet. So we kind of moved to a software service model with, we still have plugins and a theme that integrate the WordPress features. But we have a Cloud-based app builder which is a much better experience for our customers because they dont’ have to be trying to put together an app in their WordPress Admin mixed up with their site and everything. It was not ideal to have it that way. So with the Cloud-based app builder now we can do things like host push notifications for people to make it easier. It’s a better experience for them to actually build the app. And so we’re just working on that. Iterating on the platform, making it better where we can. Jonathan: Another reflection I want to give you. When I was more active in doing actual websites as having clients, you had a lot of people say, “Well, I don’t need a website. I just need an app”. And no, they needed a website and at some stage maybe an app. There seems to be a lot of that conversation. Do you think that’s clarified a little bit more as time has passed about when you need an app and when you really need a website and the difference between the two really? Scott: Yeah. We don’t have a whole lot of people coming to us to build just an app. There are the occassional few. But usually it’s people who have a website and they’re saying, “I want an app that integrates with my website and that way we can send our customers push notifications and they can have our app to sort of stay up on things that are happening”. A good example of this would be like at WooConf. I was at WooConf and not saying anything bad about them, but they didn’t have an app and I wished that they did. And the reason why is because we were supposed to go to the website to check the schedule. And then we were supposed to be in Slack community with different channels to be checking for announcements and interacting with other people at the conference and things like that. And then there’s also like Twitter hashtags and things like that. And I just found it a very disjointed experience and had a difficult time keeping up with what was happening at the conference. So if they had an app where it was like the most recent schedule. They could send push notifications when there was a major change or a big announcement, something like that. I thought it would have been really great for them to have that. So that’s kind of the niche that we’re trying to fill is WooConf needs a website but events like that, but what else will be really well served having an app that does the things that I described. Jonathan: Well, I think we’re going to wrap it up for the actual Podcast part of the show. But we’re going to be continuing. Scott’s been generous with his time and said he’ll continue the discussion which you’ll be able to see on the WP-Tonic website in the next couple of days. So we’re going to wrap it up for the Podcast. So Scott, how can people get to know more about what you are up to and about the products which you’re involved in? Scott: Best place would be on my website scottbolinger.com. And you can also find me on Twitter under the same thing @scottbolinger.